Looking for cute or elegant, but very easy and inexpensive ideas for your Easter table? Here are dozens of ideas for great flowers, centerpieces, and place cards. I have also included a wide range of links to other family friendly projects and decorating ideas. Setting my Easter table is always fun each year. Sometimes we opt for elegant arrangements with flowers and beautifully decorated eggs. Most of the time though, we get distracted by the wide range of cute Easter products on the market and end up with a table filled with candy, Easter decorations and other objects. One year we even decorated the whole table with fluffy chicks…both of the stuffed and marshmallow variety. Here are some of my favorite ideas for centerpieces, flowers, and place cards. Easter has tons of creative possibilities when it comes to fun and attractive centerpieces. Easter eggs are a primary focus in many households. Bowls, baskets, and other containers full of plain and colored eggs are always popular. In previous years I have made tongue in cheek centerpieces composed of egg related decorations, including egg cups, egg poachers, egg coddlers, and lots of chickens. Candy is always a major Easter theme in most households. You can include baskets and bowls of candy, but my favorite centerpiece is actually a simple bank of candy. Make a circle, oval, or even long arrangement of Easter grass in the center of the table. Nestle candy eggs, jelly beans, bunnies, peeps, and other Easter candy in the grass for an edible centerpiece. You can also add fresh flowers either in small vases or even loose. My husband is a jelly bean addict, and Easter in our household is more about jelly beans than chocolate bunnies. One of the easiest ways to make colorful vases to hold flowers is to use jelly beans to fill them. For fake flower arrangements, you can simply fill a large clear or translucent colored vase with jelly beans and place the plastic stems into the vase. Large vases can hold large bunches of real flowers by placing a smaller vase inside the larger vase. Fill the larger vase with jelly beans and the smaller vase with the water and flowers. My favorite floral centerpiece for Easter has traditionally been a large round bowl or soup tureen filled with the normally short stemmed tulips, hyacinths, daffodils, and irises. A large shallow bowl allows you to make a wide arrangement that doesn't block conversation or your view of other guests. Use hardy blossoms as napkin rings. Keep them in water before placing them on the table, or provide a water source for them, such as a small florist's tube. Spring flowers work very well, but roses, carnations, and other non-seasonal flowers in Spring colors can also be used with great results. I generally refrain from using scented flowers on the table, but Easter is one of those exceptions. While I personally think Easter lilies are too large and strong for the table and use them in other areas around the house, I do try to use a small amount of fragrant Easter flowers on the table. Just a few hyacinths add some scent which makes people really rejoice in Spring. This year our place cards are going to be small vases filled with jelly beans and crocuses. 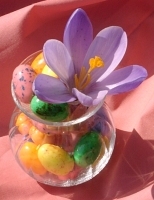 We filled tiny vases with jelly beans and then cut small crocuses from our garden. We nestled small floral tubes (small plastic test tubes) into the jelly beans and filled them with water. We added the crocuses and small name cards (not pictured) and we had a variety of inexpensive easy place cards. One of the easiest and simple place cards for Easter dinner are decorated Easter eggs. The simplest design is to take blown or died eggs and glue glitter on them in the form of your guests names. These eggs will not be edible, but they do add a sparkly touch to the table. Another way to personalize eggs for place cards is to write on them with crayons before dying. The area with the crayon wax will not absorb the dye, leaving you with a name in contrasting colors. These eggs have the advantage of being edible. In previous years we have made place cards from small doll hats. For the ladies we used small straw hats and added ribbon, flowers, and a small tag. The gentleman received top hats decorated with small Easter bunnies and name cards. Another cute and simple idea for place cards is to make egg shaped cookies. Decorate the baked cookies with pastel colored frostings and pipe each person's name onto a cookie. This makes for a nice treat as well as a tasty treat. Chocolate Easter bunnies also make cute name cards. The names can be added by placing a simple ribbon with a tag on it around the bunnies neck, by balancing a name card on the base of the bunny, or even by piping your guests' names on the side or belly of the bunny with frosting or melted chocolate. Another cute way to designate place settings is by decorating eggs to look like each guest. Check out this cute project I created for a client. A Breath of Spring - Beautiful and simple arrangements using Spring bulbs. Easter Eggs Grow Up - These easy and elegant project ideas make for wonderful centerpieces and arrangements for Spring using Easter eggs and Spring flowers. Easter Egg Tree - Make this super easy and pretty Easter egg tree. Jelly Bean Belly Easter Bunny - Make this cute project with the kids for a cute centerpiece or place card holders. Set an Easter Table - Looking for a more natural feel? These ideas are soft, natural, inexpensive, and easy to do and are made using materials you can find in your own yard. Special Ideas for Spring - These beautiful place settings and centerpiece ideas are full of fresh Spring colors and great ideas. Turn Your Tables Onto Spring - Find lots of great ideas complete with beautiful photos for your Spring table.